If you are missing or on the brink of losing one or more teeth, dental implants in Massapequa could be one of the best investments you’ll ever make in yourself. When you are shopping around for a dentist that can help you complete your restorative dental care, you want to feel confident that you’re visiting a true expert. It’s not always easy to choose with so many options available, right? To help, you can ask yourself these 4 simple questions when shopping for your ideal dental implants. Follow this sound advice to feel confident in your decision to replace teeth with dental implants. What experience or education does your implant dentist have? Implant dentistry is a technical practice that requires a high level of skill and deep understanding of the inner and outer workings of the mouth, especially in the more complex of cases. Choosing a highly experienced dentist will help to ensure that your dental implant placement will be successful. By searching online or calling the office directly, you can find out how long the doctor has been practicing. Plus, you’ll be able to find out if they have had any additional training or hands on experience with implant dentistry. 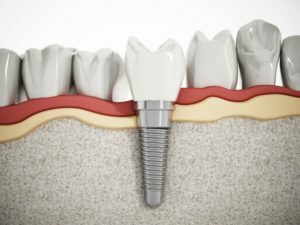 How much will the dental implants cost? Cost is a significant factor when making any decision—especially one that effects your health. It isn’t the most important thing to consider when shopping around for dental implants, though. You’ll find cheap options for implant placement or tooth replacement solutions, but will they last as long as you need them to or have a success rate of over 95%? Dental implants that are successful are a true investment in your health—one that’s well worth it. These days, it is easy to find out what current and previous patients have to say about any dentist. Take some time to read other patient’s reviews on a particular office to understand what kind of experience they personally had. See if you can find some from patients who have gotten dental implants, specifically. This will give you a better idea of what to expect. Does your dentist do it all? Dental implants are completed in two phases: the placement and then the actual restoration. Your ideal implant dentist should be able to complete both phases without having to refer you out of the office to an oral surgeon. This way, you’re dealing with the same dentist in Massapequa throughout the entire journey. After running through these quick questions, your decision should be a whole lot easier to make when you’re considering choosing a dentist to complete your implant placement. Here at The Luminous Smile at South Shore Dental Care, our dental experts are there for you throughout every step of your dental care—even when it comes to replacing teeth with dental implants. That’s right! We do the whole implant placement and restoration, creating a personalized tooth replacement for you to last a lifetime! Learn more by contacting us today! by: Dr. Stutman's Office at February 1, 2018 .